Checked this guy yesterday and didn’t see a thing! 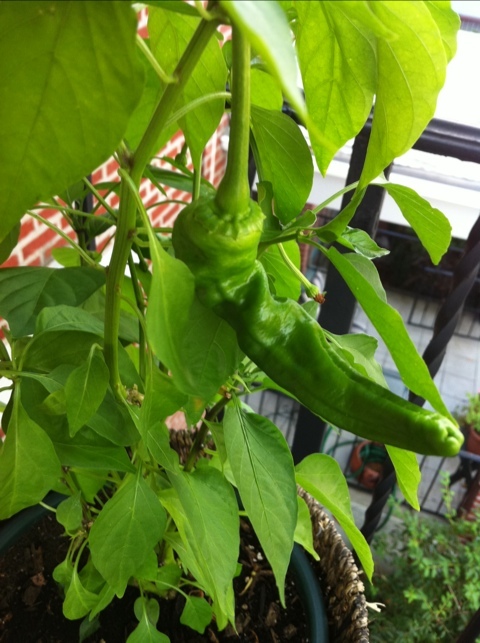 I’m growing Cayenne this year too! I see you have them in a container, do they grow well in there? Yes, very much so. They seem to really like it. I had them in containers last year as well. I didn’t even think about putting them in the ground. I have limited ground gardening space to work with, in part b/c I want to leave some open for dog and baby to play (not necessarily together – actually, never together though that wouldn’t be baby’s preference). How tall do yours get? Mine are about 1-2 feet now. Maybe next year I’ll try to make space for them in ground. I also had my tomatoes in planters last year – 1/2 in ground and 1/2 in containers. It was such a significant difference in how they grew that I couldn’t see putting any in containers this year. Huge difference in size and production.